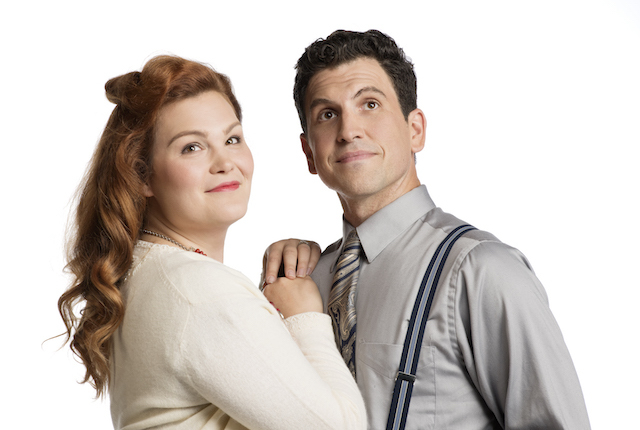 Gateway Theatre presents It’s A Wonderful Life, a new musical adaptation by Peter Jorgensen. Set to soaring songs from the ’20s, ’30s, and ’40s, this is a timeless holiday classic. With a little help from his guardian angel, George Bailey is brought back from despair on Christmas Eve to see how he has truly touched all the people in his life. Erin Aberle-Palm and Nick Fontaine. Photo by David Cooper. Holiday fun for the whole family! Travel to Bedford Falls for a joyous journey that will have you checking for Zuzu’s petals in your own pockets and make you believe that every time a bell rings, an angel gets his wings. This heartwarming holiday story is one you’ll want to share with family and loved ones. VocalEye Described Performances will run December 19th at 8:00pm and December 23rd at 2:00pm. Follow Gateway Theatre on Facebook, Twitter, and Instagram for more information. I will draw one winner at random from all entries at 8:00pm on Wednesday, December 5, 2018. Update The winner is Emily! Been a while since I’ve seen a play. Never seen this one would love to go! I’ve never seen this as a musical live on stage! Watch this every year. Go George Bailey! Watch this every year. George lassos the moon! I would love to go to this!